The Sky Tower is 328 meters tall and stands as an icon of Auckland’s sky line. It’s an exciting hub of adrenaline activities, superb dining and breathtaking views. Sky Tower is one of Auckland’s most exhilarating tourist attractions. The tower has 3 viewing platforms and is the tallest man made structure in New Zealand. For the more adventurous souls, try their SkyWalk or their SkyJump! Don’t forget to check out the school holiday activities at the Sky Tower, which are held three times a year and provide fun for the whole family. Sky Tower may be closed from time to time due to adverse weather conditions. May to September daily last ticket sold at 9:30 pm. October to April from Sunday to Thursday last ticket sold at 10:00 pm; Fridays and Saturdays 8:30 am to 11:30 pm, last ticket sold at 11:00 pm. How popular is Sky Tower? People normally club together Saint Patrick's Cathedral and Cornwall Park while planning their visit to Sky Tower. Staff are great and really helpful and the systems and set up is great. The cafe setting was beautiful but drinks were very average i understand you pay a premium to get coffee thousands of feet high but would expect normal to high quality still. Great family experience. Love coming here. Grab your premier rewards card to get free parking and is handy to get around the city. There's always something cool to look at when there is a special occasion too. Really enjoyed the views, the see through floor that they have is really cool! Very well organized. Their gift shop had many pretty options for souvenirs. And the experience of seeing part of the view while you go up is great! We decided to go up the tower on the last day of our NZ holiday, parking nearby on a public car park. We hadn't booked. Our photo was taken on the way in. The weather was good so we had wonderful views on Level 51 and Level 60. The lift to the levels was extremely quiet and smooth, and there was a lift operator. Afterwards we went to the Sky Cafe for a coffee and then bought our photos in the shop. Recommended. A very nice view of Auckland plus the surrounding area. We did it at night to see the lights and really enjoyed that. There are 2 levels you can view from. I believe the top level was 62 floors up. You can take your time for many photo opps. There is informative facts posted about to read, one that compares all the skyscrapers of the world, that was interesting. There is a see through floor section where you can see straight down from the top. 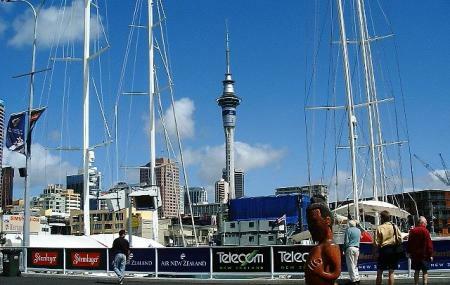 Nice place to add to your to do list while in Auckland.